Wednesday January 1st 1890 I felt very tired and did not do much of anything all day. Mother came home before noon. We looked for Ida over all afternoon but she did not come. I worked a little on my edging and went to bed early. It is eighteen years today I began keeping diary. 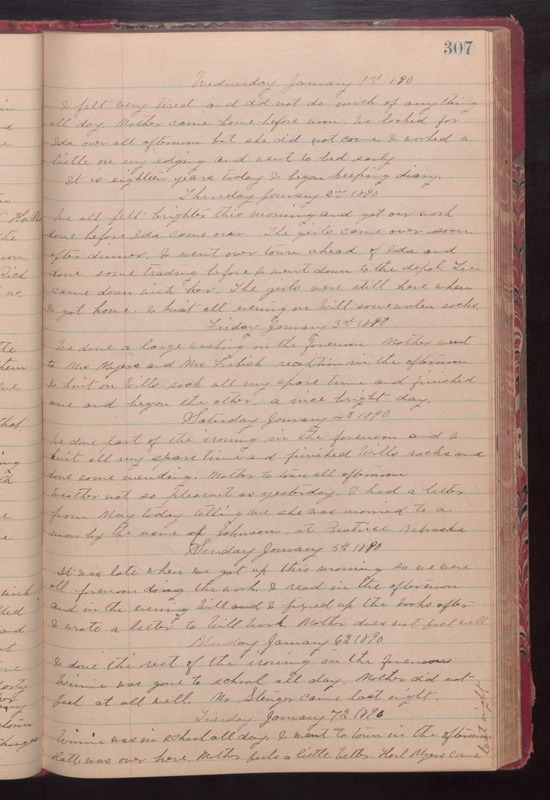 Thursday January 2nd 1890 We all felt brighter this moring and got our work done before Ida came over. The girls came over soon after dinner. I went over town ahead of Ida and done some trading before I went down to the depot. Lee came down with her. The girls were still here when I got home. I knit all evening on Will some woolen socks. Friday January 3rd 1890 We done a large washing in the forenoon. Mother went to Mrs Myers and Mrs Firbish reception in the afternoon. I knit on Wills socks all my spare time and finished one and began the other. a nice bright day. Saturday January 4th 1890 We done part of the ironing in the forenoon and I knit all my spare times and finished Wills socks and done some mending. Mother to town all afternoon. Weather not so pleasant as yesterday. I had a letter from May today telling me she was married to a man by the name of Johnson at Beatrice Nebraska. Sunday January 5th 1890 It was late when we got up this morning so we were all forenoon doing the work. I read in the afternoon and in the evening Will and I fixed up the books after I wrote a letter to Will Work. Mother does not feel well. Monday January 6th 1890 I done the rest of the ironing in the forenoon. Winnie was gone to school all day. Mother did not feel at all well. Mr Stenger came last night. Tuesday January 7th 1890 Winnie was in school all day. I went to town in the afternoon Hatt was over here. Mother feels a little better. Karl Myers came last night.